This high-voltage pulse supply will generate pulses up to 30 kV. Ql and Q2 form a multivibrator in conjunction with peripheral components Rl through R6 and CI, C2, C3, C5, C6, and D2. R9 adjusts the pulse repetition rate. R2 should be selected to limit the maximum repetition rate to 20 Hz. II is a type 1156 lamp used as a current limiter. R9 can be left out and R2 selected to produce a fixed rate, if desired. Try about 1 as a start. Q3 serves as a power amplifier and switch to drive Tl (an automotive ignition coil). 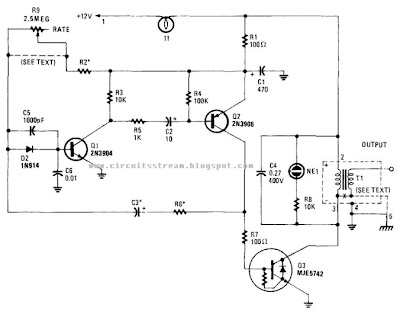 NE1 is used as a pulse indicator and indicates circuit operation. Because this circuit can develop up to 30 kV, suitable construction techniques and safety precautions should be observed.